Now you have your project created let's write some code! Your code is located in a file called HelloWorld.java in the src folder. Your screen layout file is main.xml in the layout directory. Right click on "Hellow World, HelloWorld!" TextView and select "Remove"
View/edit the XML by clicking on "main.xml"
Change android:text="@+id/Button01" to android:text="Click Me"
Now we have a button let's make something happen when the button is pressed. Open "HelloWorld.java" file. There is already code for when the class is created that set's the content view. Add the highlighted code on line #5. Create a button object and reference the button we placed on our layout. After you add the following line of code you will get an error. This is because you need to import "android.widget.Button". The fastest way to import is the hotkey Ctrl-SHIFT-O. This will add all missing imports. Register a callback to be invoked when this button is clicked. Add the highlighted code in lines #6-#10. Now let's add some code in the method "OnClick" to pop up a message when the button is clicked. Add the highlighted code on line #9. Now let's run our new application. You will get a dialog "Run As". Select "Android Application"
You may receive "Android AVD Error" if you have not setup an android emulator device. Press "Create AVD". Be patient it will take a minute to create your new AVD. Select your new AVD and run your application. Try removing "@Override" on line 18.
change line 15 from "setContentView(R.layout.main);" to "this.setContentView(R.layout.main);"
Please feel free to post comments or questions. I will do my best to answer your questions. wow greg ! way to go....! what is the difference between eclipse 3.5.1 and galileo SR1? Galileo SR1 is one of many "flavors" of Eclipse 3.5.1.
hey please help me.I done this same tutorial but i am not getting the output. @Anu I would be happy to try and help. Post your class file and xml layout file. Also, try and copy/paste my code and see if that helps. If you are experiencing an error with an @override for onClick (line 18), check your JAVA JDK version. You probably are running JDK 5 versus my JDK 6. Hey Greg, even Im getting the same problem as of Anu's. Were you able to resolve her problem?? After a long wait it says...Process android.process.media is not responding... HELP!!! I would be glad to assist. Please post the relevant code and I will look it over. Cheers, just figured that out and its all good now, thanks. Its running fine now except I am having the same issue as anu. It loads the homescreen fine but there is no button to click and there is no way to access the application. Any ideas what might be going wrong. But googling that seems to suggest that it can be ignored and does not affect the application. I think that I may have just solved this problem and this might work for the other people suffering the same problems as me. That got it all working for me. @Sam, thanks for sharing your fix to this issue. Everything looks identical but when I run HelloWorld I get "Conversion to Dalvik format failed"
Type is Android Packaging Problem. Am using JDK 6 update 20. Removing the @Override will clear your error. Please help me, I have tried reinstalling everything three times. For the first error make sure you have a button Named "Button01" on your view. For the second error remove the @Override just above the error. If that doesn't solve your issue email me your zipped up project. Please email me at Rfah614M1BbM@meltmail.com so I can get your email address, I really appreciate all the help you are giving me and other users :). To solve this "OnClickListener" error, cross verify the import items in your code, with the source code that is posted here. I'm trying your Hello World example but just get the 'Android' text on the screen. I've also tried another sample (flashlight) from the internet, nothing goes on the screen. android:text="Click Me" android:id="@+id/Button01" android:layout_width="wrap_content" android:layout_height="wrap_content"
I'm using Eclipse 3.5 on windows xp. I got it working, turns out I need to wait about 5 minutes, then the button and text appear. Had a similar issue with incorect Arguments for OnClickListener. Needed to more fully specify this as View.OnClickListener. No new android project menu found. Please help..
"OnClickListner cannot be resolve to a type". I have different prob. AVD is running , I can see emulator window and able to do operation on GUI. But when I run command "adb devices" I get no device listed. I'm a newbie in this programming. I'm trying to learn about Android SDK and i'm learning through tutorials in the SDK website. The problem is, i'm having trouble opening xml files in Eclipse. When i double click the xml, the software will either crash or stopped responding. Anyways I'm running Eclipse Helios on Win7 64bit. Any help? I've just got one question: How can i transform the JAVA and XML files into a .apk file? Your compiled .apk file is contained in the bin folder of your project. You can also deploy directly to your phone over a USB cable. Have you made some other guides that will make a little more sophisticated app? I'm afraid mine might be a bonehead problem. 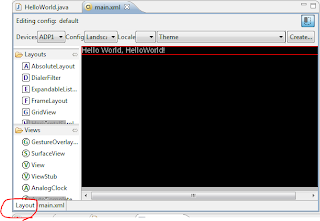 I have created your Hello World app in Eclipse Galileo, and have run it successfully on the Android emulator in Eclipse. I am trying to deploy .apk to my Nexus 1. In your response to Michno, you said "...deploy directly to your phone over a USB cable." Sounds good but is not working for me. I have connected my Nexus 1 with a USB, and am using the webshare app to move the .apk file from my PC (Win 7 x86 OS) to the nexus. Though WebShare tells me the .apk transferred successfully, I can't find it on the Nexus. Also, I'm getting an error message on the PC saying that there is no disk where the nexus is supposed to be. What am I doing wrong? Any help or links or suggestions are welcome. Any idea what I might have screwed up? Thanks. Well, I figured out why I was having problems with the Android SDK. I have a 4 year old laptop that doesn't have a very fast processor - its an AMD Turion 64 X2. So I was waiting for 10-15 minutes for this thing to finish - would get the "not responding" message. I thought the thing had failed - but yesterday I looked at the Task Manager and could see that the SDK process was still cranking away. So 25 minutes later, it finished and I got my Android2.1 Virtual Device. Had similar issues today with running HelloWorld - took a really long time to set up, and I got error messages along the way, but once it finished, the app was loaded and it worked. So I'll be springing for something like an i7 Intel laptop in the fairly near future. Thanks again for the great tutorial - would have been difficult to get set up without it. is there any minimum size of SD card ? i am getting error tools folder not found plz help? First I got the screen with "android" on it > then with the android screen lock and sound icon. @rana, I added a download link for the complete source code. See if you can run my code or update yours to match mine. Thanks much Greg. Hitting the same with your code. Appreciate your help. googled it and someone solved it by modifying AndroidManifest.xml - did not mention how. 2) Change Button01 to button1. 3) Comment out "@Override" on line 18. 4) WAIT for the device emulator (5 to 25 min depending on your system). Why does the emulator load so slowly? Is there a different version than 2.1 that is actually usable? Im having trouble with the new project creation part. Everytime i go on to click the Finish button i get an error saying: "E:\\android-sdk-windows\tools\lib\proguard.cfg (The system cannot find the file specified)." Plz help as im new to the environment. Im using Win7 + eclipse IDE(v3.6 helios). I added "" right before the ending menifest tag to avoid warning. In the following code "setContentView(R.layout.main);"
I am getting an error "R cannot be resolved to a variable"
how can i fixed it..
Download my complete example and run it. Then compare it to your project. To solve it, copy your folder ".android" from D:\... into C:\Users\pcname\. Is there a way to change the emulator path from C: to D: instead of copying the folder? It would help a LOT. when I am building my code it gives me an error, " Dalvik Format failed with error 1"
Can anyone tell me what does this mean..??? [2011-09-04 07:46:42 - Emulator] invalid command-line parameter: Files. [2011-09-04 07:46:42 - Emulator] Hint: use '@foo' to launch a virtual device named 'foo'. This @foo problem is because of the SDK location. I had a long path for program files which caused this issue. Some suggested to use ~ for the directory having space. That seems to work. I installed SDK in a direction "Android" and it worked perfect. Good work Greg. Really enjoyed my First Android App!! Great! Thanks for sharing the code. I had missed a show() method call and I was tearing my hair out! i am new to android, plz suggest me some tutorials for learning it.. If you are experiencing an error with an @override for onClick (line 18) you can correct this by right clicking on your project and select "Java Compiler" and setting it 1.6. You probably are on 1.5. That should correct your override errors. It saved a lot of time..Selecting 1.6 really solved it.. The Words "Hello World" appear in my application. Where is this text coming from, it isn't in the main.xml, it isn't in the java source file. Is it something I can edit ? or do all android applications have to say "Hello World", I have only been programming for 20 years, so perhaps modifying the "Hello World" text is beyond me... maybe I shouldn't be tinkering with the hidden "Hello World" string that is embedded deep in a secret file that is part of every project, but can't be found or edited. If you ran my sample Hello World is on line 9 of HelloWorld.java. I have never seen hello world just appear in an app. I am getting an error. "R cannot be resolved to a variable" how do I solve it? I ran your code and it worked, I received a popup message hello world. Your issue must be somewhere else. If you email me the entire project folder zipped I can take a look. Also you can download my complete example and run it and see if it works for you, then compare the two projects. I would always start the Emulator first before doing any coding in future. So slow to start. I think shutting down anti-virus can help speed it up but not ideal obv. First off a very big Thank You for your pages here! They are a great confidence builder for new Android developers. I ran into one problem that prevented me from getting the app to run on Eclipse 3.72 with the latest Android SDK and Java JDK on Win7. I nearly posted asking for help and I was able to fix it myself. Your main.xml example at the top has linearlayout and button markers. That caused Eclipse to crash just starting the app. When I changed them to LinearLayout and Button (both mixed case, not lower case) the problem went away. and gives a nice big callstack. You may want to add that case check to the eratta notes for those who just copy/paste and have not yet absorbed all of the Android subtlties. Hello, just wanna ask why do this line get an error? I am unable to get the option Android project in Eclipse Indigo. I downloaded 752 mb android sdk folder, it has android 1.5 to 3.0. I even downloaded Android plugin in Eclipse. But still it is not showing Android project. What should I do? M just getting screen written 'android' on it. Code had no error. What could be the problem? My first droid Hello World! After a couple tweaks : remove @Override and rename button1 it worked! Cool!!!! emulator-5554 disconnected! Cancelling 'com.example.helloanroid.HelloAnroidActivity activity launch'! Could you please help me here! Nice information, many thanks to the author. It is incomprehensible to me currently, but in general, the usefulness and significance is overwhelming. Thanks again and fine luck! it says...failed to instal 001HelloWorld.apk on device emulator...will you tell me why...? 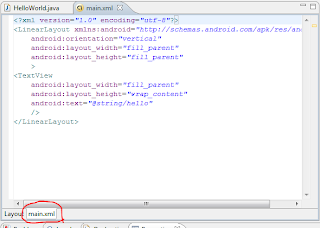 hi every one am new in android development and i get an error which says unreachable code on button1 underlined red Button clear=(Button)findViewById(R.id.button1); and the following lines it doesn't say anything. help me what is the problem. Excellent tutorials for beginners....Really good work!!!!!! can you guys help me regarding source codde of 'android web browser' that can be run as an application using monkey talk,, i a am done with the hello world project and its recording the script..
please provide me a zip file similar to the hello world. I shall be very thankful to you. i have tried few from internet, but there are so many errors during the run , so the smulator is not opening. We are a leading software company dwarka,India which works as per the client requirements and give provide software. Good work, thank you so much for sharing this, it's really excellent. Android change the world of smartphone. Now days most of peoples are just taking Android OS mobile phones but few peoples are using iOS operating system. Waiting for ios 9 release date. Videocon Telecom plans to offer 4G data at 2G/3G rates to encourage early adoption, and will be offering bundled devices as well.Videocon Telecom said that it plans to roll out 4G services in Uttar Pradesh West, Uttar Pradesh East and Bihar Circles. We understand that businesses are on the outlook for android app development company that can help fulfill their comprehensive android app needs. This is why Webnet offers a broad range of android app services to businesses. Custom Android App Development is said to have a showing position in the Smartphone market as Android is a mind energizing stage to make Smartphone applications. oh thank you for the post! it is very great!